I get a warm feeling when I hear from people who have bought or received my prints and it’s lovely when they send me pictures of them. This is the Glastonbury print at A1. 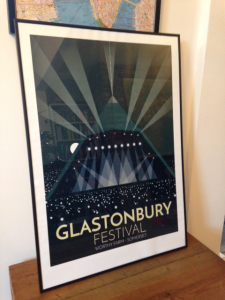 I usually only sell them as A4 or A3 as that’s what my own printer can handle but I’ve been working with a local printer to see if I can offer my prints at a bigger size and Glastonbury was the guinea pig. I really was pleased with it and thankfully so was the customer Lisa. It was Lisa who suggested that I do Glastonbury and over the email exchanges I found out that she was a photographer. I really like her work. I especially like how she captures the women who feature in her ‘intimate’ section. It’s a refreshing change. Beautiful. Keep up the good work Lisa. As for me, I plan to start offering bigger sizes soon. There might be a longer lead time on them as I will have to build in printer time but they do look good printed at poster size even if I do say so myself.